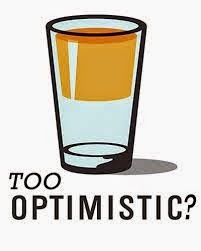 Houses & Homes VA: Is there such a thing as being too optimistic? Is there such a thing as being too optimistic? Over the years I’ve heard all of the benefits of being an optimistic person, we all have. I myself am very optimistic and I know that attitude is everything if one wants to succeed in life. I have even seen studies that conclude that optimistic people live longer and enjoy better health. With all of this in mind I do sometimes wonder, “Is it possible to be too optimistic”? We’ve all met that person that is never worried about anything. While people with this type of personality are a joy to be around is it possible that they are less prepared to deal with problems than those that are a little less optimistic? I feel that if a person never expects to have a problem, if they fail to anticipate difficulties than they will also fail to plan for it. Maybe an optimistic person is less likely to formulate a “plan B’ in the event that their original plan doesn’t work out. A more pessimistic individual is more likely to expect problems and therefore more likely to plan accordingly. In my humble opinion a certain balance between optimism and pessimism is probably the best road to choose. I consider myself to be very optimistic but I always have plan B ready to go just in case. This has served me well throughout my life, especially in business matters. I believe that asking “What if?” before something happens is much better than asking “What now?” after everything has fallen apart. Remember, the designers of the Titanic were very optimistic. So much so that there weren’t nearly enough life boats on the ship for all of the passengers. They felt that the ship was “unsinkable” and that the added expense of additional lifeboats was completely unnecessary. We all know how that story ended. I’m not saying to go around expecting everything to go wrong. I am saying that it is best to be prepared for any eventuality. My motto is “Hope for the best, plan for the worst”. Optimism and realism are great partners and will serve you well if you can achieve the proper balance of both.